CLEVELAND — Before the end of the third quarter, DeMar DeRozan of the Toronto Raptors had shed his jersey as he made the slow walk to the visiting locker room at Quicken Loans Arena after getting ejected for a flagrant foul. His season was over, ingloriously, and with it the dream of finally thwarting the nightmare known as LeBron James. The Raptors keep having the misfortune of seeing James in the N.B.A. playoffs. The same James who, so often, has used the Raptors as a canvas for some of his finest work. The same James who has such a psychic hold on the basketball-loving fans of Toronto that he might as well be mayor of “LeBronto,” a label that grew in popularity in recent days as James and the Cavaliers were sweeping the Raptors from the postseason. The same James who refuses to let anyone else from the conference have any fun. 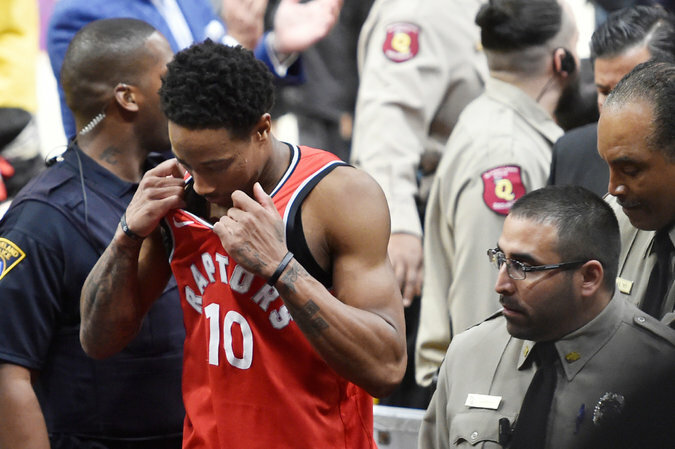 DeRozan, whose ejection came after he slapped Cavaliers guard Jordan Clarkson across the face as he rose for a layup, was spared the additional trauma of watching the final moments of the Raptors’ latest LeBron-driven catastrophe. With their 128-93 victory, the Cavaliers completed a four-game sweep of the Raptors in the Eastern Conference semifinals. After getting swept by the Cavaliers in the conference semifinals last season, the Raptors overhauled their approach on offense, emphasizing a sharing-is-caring playbook that was designed to make them more difficult to defend in the playoffs. It seemed to work. The Raptors finished with the top record in the East, setting a franchise record for wins. They ranked among the league leaders in offensive and defensive efficiency. And ultimately none of it mattered. Cleveland turned Toronto’s fancy new playbook into a fine dust. It was not his intention, but it almost seemed as if James was throwing a bouquet of flowers on a coffin. The sad reality for the Raptors, who have been around since 1995, is that this was their best chance to reach the N.B.A. finals for the first time — and maybe, just maybe, contend for a championship against one of the titans from the West. James is operating at the peak of his powers, with averages of 34.3 points, 9.4 rebounds and 9 assists through the first two rounds of the playoffs, all while shooting 55.3 percent from the field. Yet the team around him is not exactly reminiscent of the Showtime Lakers, or even the Cavaliers of a year ago. Besides, consider what the East will look like in the seasons to come. The Boston Celtics and the Philadelphia 76ers are both ascendant teams, with young stars who will surely improve with age. The Indiana Pacers, who can build around Victor Oladipo, pushed the Cavaliers to seven games in the first round. And the Cavaliers — well, who knows? James will have a role in their future, for better or for worse. But the conference is on the rise. The Raptors are still capable of competing, of course. Kyle Lowry, 32, and DeRozan, 28, both have extensive long-term deals. It is uncertain, though, where the Raptors go from here. Casey used three different starting lineups in four games against the Cavaliers, which was difficult to interpret as anything other than a sign of exasperation, or desperation. He went so far as to bench DeRozan for the fourth quarter of Game 3, as the Raptors mounted a comeback without him, only to have James win the game for Cleveland with a skyscraping, single-legged floater as time expired. Casey’s job status was tenuous even before the start of Game 4, and so much of it was because of one man. James finished the series with 136 points, 45 assists and 33 rebounds. DeRozan and Lowry combined for 138 points, 46 assists and 30 rebounds. DeRozan spoke with more than a trace of resignation, which was understandable. It is cruel what James has done to the Raptors, who have experienced various iterations of him over the years: Dominant LeBron, Playful LeBron, Clutch LeBron, Soul-Crushing LeBron. They saw all the LeBrons in this series. For the first half of Monday’s game, the Raptors were left in the swirling wake of Facilitating LeBron, a consummate teammate who created for everyone else. He looked to draw charges. He delivered behind-the-back rockets. He deflected passes out of bounds. Then came the third quarter, when James scored 15 of his 29 points to turn a halfway competitive game into a rout. He soon began looking ahead — to another appearance in the conference finals, to the possibility of competing for another championship. The Raptors, meanwhile, left the arena for a pair of idling buses, another premature exit as the team coped with its familiar role as a stage prop for greatness.